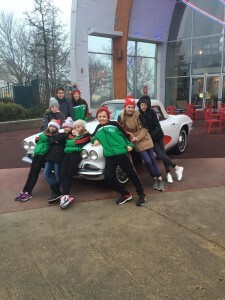 Kenmare News | Young local dancers perform live in Disneyland, Paris! Young local dancers perform live in Disneyland, Paris! Dreams became reality this Christmas for 30 talented local children from 7 to 17 years of age as, accompanied by proud parents and mentor Bernie O’Sullivan, they boarded a flight to Disneyland Paris. The Bernie O’Sullivan School of Irish Dancing troupe were chosen from vast competition to perform LIVE on stage in front of a huge multi-national audience in Disneyland Paris’ Videopolis Theatre. Their performance, which took many months of hard work, dedication and determination was thoroughly enjoyed and much applauded by the theatre’s delighted audience, so much so that Disney management have already invited the team back to perform again in 2017!